On August 6th in 1832, the cholera epidemic that had been sweeping through England and Europe had finally reached the shores of Jersey. Go back through the death dates of some of your ancestors. You may find you have people in your family tree that died around this time and cholera may have been the reason of death. ‘When the cholera reached Jersey on August 6 1832, there had been a heavy downpour of rain the previous day and Dr Hooper theorised that the movement of all the accumulated filth in the streams helped spread the disease. The majority of my ancestors were town dwellers, so this is of interest to me. Although I have not been able to always find specific addresses for this time as it was before the first Census in 1841. I scan through all my family trees for all the death dates during this year and only find a date match with my Davey family. The Rabet’s didn’t arrive in Jersey from Brittany until the turn of the century in the early 1900’s. The Lozuet’s were living in St. Ouen at this time so were relatively safe (I presume). William writes his Will & Testament four days before he dies in St. helier, leaving his wife Mary Defrance as executor and his children are his heirs: Thomas, Rachel, William, Isaac, Mary Ann and George. Unfortunately his Will does not state his address unlike his son Isaac’s Will & Testament 60 years later. It says that he is ‘of sound and disposing mind.’ I don’t have a copy of this death certificate, so I can not confirm whether he was ill from cholera. He died at the age of 52. According to Dr Hooper’s carefully kept statistics, 803 people were taken ill and 347 died over an eleven week and five day period. The deaths were so concentrated in the poorer parts of town, that the Rector of St Helier had to inaugurate a new Strangers’ Cemetery (below Westmount) on August 27 to cope with the extra burials. On October 27, the Board of Health reported the Island free of cholera and adjourned, the very day that the first case was reported in Guernsey. Sadly, another cholera epidemic returns 16 years later, in 1848. You can read more about it in an article in the Jersey Evening Post: Containing Cholera In The 19th Century. My next step is to get hold of a copy of William’s death certificate from the Jersey Registry Office to confirm details of his death. I may have had more ancestors that fell ill or died from the cholera in 1832, but I do not know many of their dates of death. This is especially the case with my female ancestors. If I do not know the surname of the man they married I cannot trace their whereabouts and therefore when they died or where. 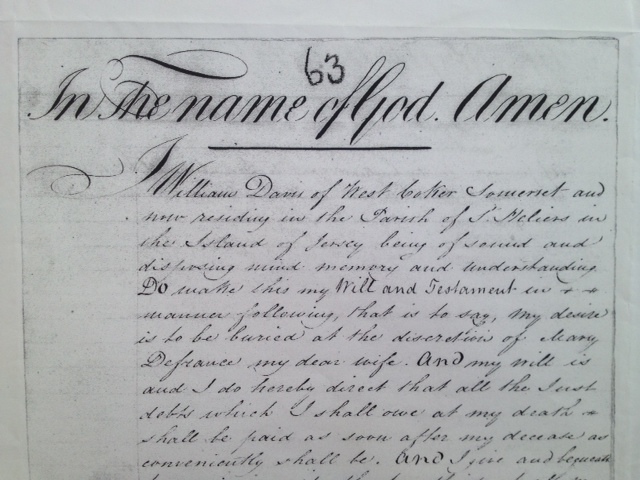 Have you found a family death during 1832?